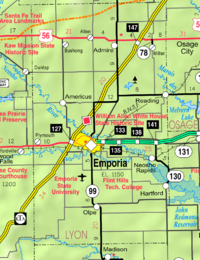 Lyon County is located in the east central part of Kansas with a population of 33,601. At approximately 40x20 miles in size, the county encompasses nearly 844 square miles. The Lyon County Courthouse is located at 430 Commercial St. in the city of Emporia which is the county seat. Four rivers traverse the county which include the Neosho, Cottonwood, Verdigris and Marais Des Cygnes. Lyon County has four libraries, several museums, one newspaper and is home to William Allen White, National Teacher’s Hall of Fame, Kansas Business Hall of Fame and NASCAR Driver, Clint Bowyer. Emporia is also recognized as the Founding City of Veteran’s Day.